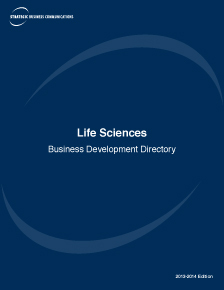 A controlled circulation business development directory profiling all major organizations involved with life sciences. Comprehensive worldwide coverage of the market from emerging private companies through to the major global market leaders, as well as investors, service providers and other relevant organizations. Exhaustive coverage of pharmaceuticals, biotechnology and medical devices sectors. Distribution: 22,000 qualified executives involved with life sciences, including senior Fortune 1000 and Global 500 decision makers.